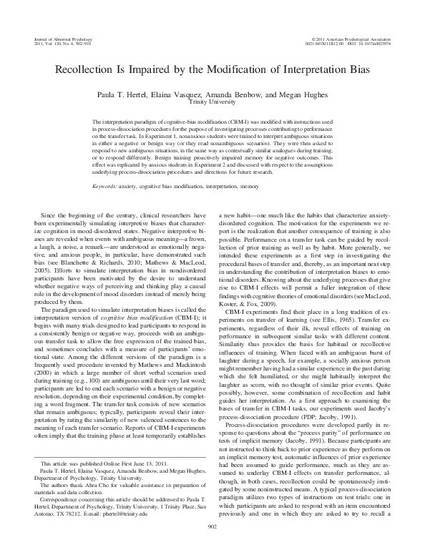 The interpretation paradigm of cognitive-bias modification (CBM-I) was modified with instructions used in process-dissociation procedures for the purpose of investigating processes contributing to performance on the transfer task. In Experiment 1 nonanxious students were trained to interpret ambiguous situations in either a negative or benign way (or they read nonambiguous scenarios). They were then asked to respond to new ambiguous situations in the same way as contextually similar analogues during training, or to respond differently. Benign training proactively impaired memory for negative outcomes. This effect was replicated by anxious students in Experiment 2 and discussed with respect to the assumptions underlying process-dissociation procedures and directions for future research. Hertel, P. T., Vasquez, E., Benbow, A., & Hughes, M. (2011). Recollection is impaired by the modification of interpretation bias. Journal of Abnormal Psychology, 120(4), 902-910.